Control iTunes from your menu bar. Is there a better alternative to You Control: Tunes? Is You Control: Tunes really the best app in Desktop category? Will You Control: Tunes work good on macOS 10.13.4? 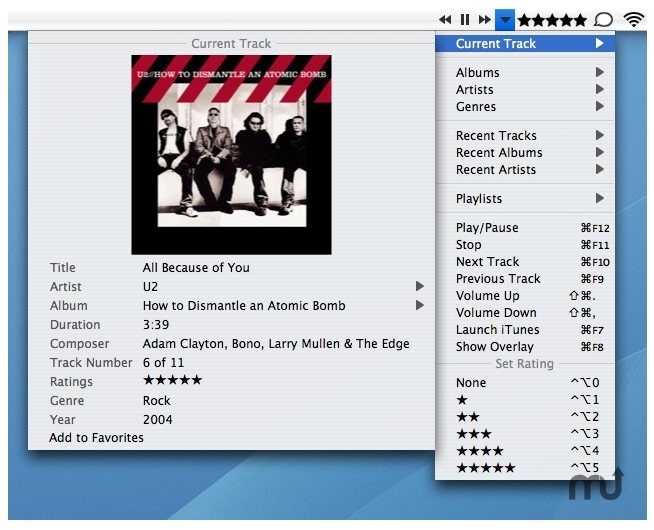 You Control: Tunes is a free utility that gives you complete control over iTunes from the Mac OS X menu bar. You don't have to stop whatever it is you may be doing, switch to iTunes, take care of business and then go back to your original app. You can now simply pull down your very own custom menu that gives you access to the iTunes controls (Next, Previous, Volume, Play/Pause, Stop) as well as displaying the current track, artist and album. You can also navigate your entire iTunes music library from this menu as well so you never leave your current application. [New] Holding down the Option key in while clicking on the controls in the menu bar will toggle the Ratings stars on and off. [New] Show Overlay menu command now toggles to Hide Overlay, so the same hot key can be used to both show and dismiss the overlay. Mac OS X 10.4 or later, free serial number. Fixed a bug that could cause iTunes to not hide properly when it is launched by the controller to play a track. Fixed a bug that would cause changes made to the current track in iTunes to not be reflected in the overlay. Fixed a bug on 10.5.6 that could lock up the system when using menu hot keys. Fixed a bug that could cause menu hot keys to only work every other time.